If I had a nickel for every time I've heard "this is the year for mobile," I would have many, many nickels. Probably enough to buy a new mobile phone. But tell people now that "this is the year" and you will likely get a much less skeptical response. The mobile phone has completely transformed how the human race communicates and interacts. Mobile phones are an indespensible item and carried with the same priority as identification and credit cards. But, by and large, mobile phones have remained just a communication device and occasional brick-breaking diversion. That era is over. And 2010 will truly be "The Year of Mobile." Not convinced? Below are five reasons I'm right. The numbers. Analysts at market intelligence firm IDC claim that more than a billion mobile devices will be connected to the Web by the end of 2010. That's close to the predicted number of Web-connected PCs, at 1.3 billion. IDC also notes that the growth rate of mobile devices is 2.5 times higher than that of PCs. The explosion of Web-connected devices ensures that websites will continue to optimize for the mobile Web. Mobile screens are still small - meaning that a mobile-optimized Web is a necessity, not an afterthought. And now. Mobile banking and transactions. Where there are consumers, there is money to be made. Mercatus Center at George Mason University recently conducted a survey and found that banks with mobile offerings can increase new customer acquisition by 60 percent. They also found that consumers were more likely to choose a bank for their mobile offerings over online banking, access to ATMs or nearby branches. When consumers are comfortable handling their hard-earned cash through a mobile device - with the endorsement (security) of their banks - making any number of purchases is a no-brainer. There's also the rapid development of micro-payments by companies like Google, and this handy device, making mobile credit card processing fast, easy, and accessible to anyone. Nothing pushes development like economic opportunity. Droid. Sure, the iPhone broke the mold and is still unrivaled. But Droid is the most significant competitor to the iPhone. 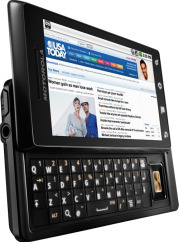 Most important, Droid upped the ante with Verizon's unmatched 3G coverage and huge network of mobile subscribers. The mobile Web is faster than ever and more accessible to a growing mobile Web userbase. Competition is always a good thing and Droid unquestionably forces the hand of every mobile device manufacturer, including Apple. More 3G-enabled devices means lower price points to entry per user, resulting in higher demand for mobile Web functionality. Social networking. Some people speculate that the first release of Facebook's iPhone app single-handedly strained the entire AT&T mobile network. I don't doubt it. Social networking is not a trend, it's a new standard in global culture. It also lends itself nicely to mobile. It's a natural communication platform, a way to connect people, even a viable way to market goods and services to people no matter where they are. There are now more than 350 million Facebook users alone, and it's safe to say the overwhelming majority of them have mobile devices. Affordable Apps. Predictions are that 300,000 apps will be available for the iPhone by the end of 2010, along with more than 50,000 through Android. Those numbers have the potential to go even higher, as apps become more affordable to create. Companies like AppBreeder, BuildAnApp, Appcelerator and a dozen or so others can build apps (or give you the tools to do it yourself) for under $100. You don't even need a business to get int he app game - AppIncubator lets you simply submit an idea, then share the revenue from the finished product. Apps drive smartphone adoption. Think about consumers walking around with dozens of businesses in their pockets. There might be no better way to build brand equity with users than an app - they are completely opt-in. The question is not if 2010 is the year of mobile. It is. The real question is, what are you doing to prepare your business?